CIY.Club is now available in a 90 minute block! 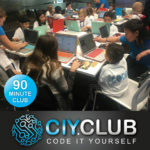 For those young coders who want to make the most of their weekly Club time! Learn the foundations underlying some of todays most exciting areas of Technology! From Game Coding and Website Development, to 3D printing, Robotics or App Design, Coders are encouraged to follow their interests and embark on a journey which will see them Learn, Train and Master skills for the future. Come and join your local club today! **Club sessions commence on the date specified, during the 90 minute time-slot selected by Coder(s). Sessions are recurrent each week at the same time for the 7-week Club period.